Efficient order management lies at the heart of successful businesses, and ecommerce stores are no exception. According to BuiltWith, Magento is one of the top five ecommerce sites. It is also a prime choice for e-merchants who opt for other platforms. A newborn Magento 2 has turned into a honeypot for a bevy of e-stores, and even Magento 1 devotees favor it. So, the increasing number of online merchants switch from their ecommerce platforms (e.g., Magento 1) to Magento 2. Data migration is a daunting task, as it’s vital to ensure smooth and faultless data transfer between the two systems. Magento orders export is one of the most common problems when it comes to data migration between two ecommerce platforms. Quick and efficient transfer of order data between Magento and third-party solutions is also crucial if the online merchant uses third-party software (e.g., CRM systems) that employs this data. Tech-savvy e-businesses that migrate order data by their own efforts usually avail the default Magento functionality that allows exporting order data right from the order grid. Magento admins access the admin panel and go to Sales > Orders and hit the ‘Export’ button to export their orders to CSV or Excel XML file formats. This is a useful way for those e-stores that need all the order data. If they need just some order-related information (e.g., the order status history), admins will have to open the exported file to manually remove the unnecessary data. It won’t take too much time if the store is small and it was opened a half a year ago. But what if the store is large and you established it, let’s say, more than ten years ago? Your employees won’t make a short work of deleting the information. They may spend a week or so dealing with the file. You certainly can ask someone with the programming skills to extract the required information, but it will still take some time. Magento’s migration tool is a perfect solution if you want to effortlessly transfer orders and other data from Magento 1 to Magento 2. But if you are not going to migrate from Magento 1 to Magento 2 or you would like to migrate just some order data, you’ll need an experienced Magento developer to make some changes in the config file and take proper control over the migration process to transfer the necessary order information. 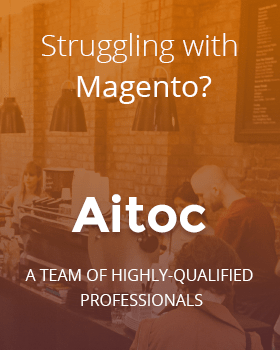 Why don’t you choose an extension for Magento that will do all the work for you? There are many out-of-the-box modules that can take care of your Magento order data. 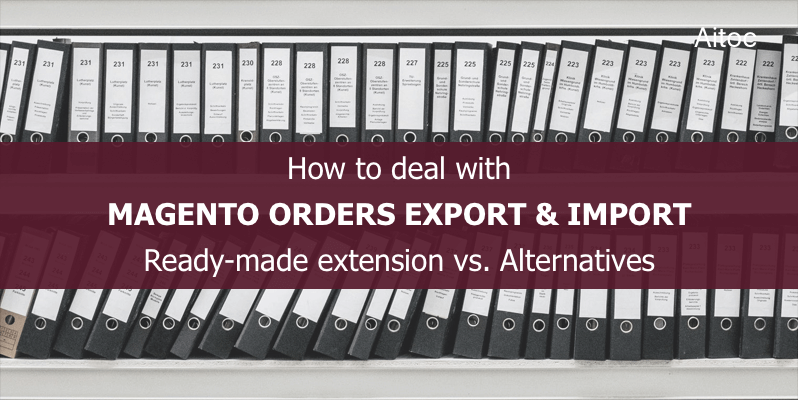 For instance, Aitoc’s extension, Magento 2 Orders Export and Import, comes in handy when you need to export or import Magento orders. Being easy to install and simple to use, this module allows exporting and importing specific order-related data by selecting different order entities and fields: order addresses, invoice items, credit memo comments, shipped items, and so on. Magento Orders Export and Import exports the required data in the following file formats: XML, CSV, and Advanced CSV. Store admins can not only choose order data for export, but also change the extensions’ settings by selecting where to export the file (to a local server, remote FTP or an email) and configuring the automatic export. Besides, files with all the exported orders are stored in the admin panel and you can download them whenever you need. In short, you can export your orders manually from the order grid by choosing necessary orders or automatically after checkout, once invoices for all products in the order are created or with the help of cron. You can then utilize the exported files to transfer your orders to a different Magento installation or third-party software. With this extension, you can also effortlessly import Magento order data to corresponding store views. The module allows creating new customers during the import by using their billing/shipping addresses. It also manages the order information in a way convenient for e-store owners: the extension lets Magento admins tune the import behavior according to their needs. Thus, it can replace existing orders with the imported ones, remove orders with IDs specified in the imported file, and append the existing complex data. Here is one more advantage of the module: it checks order data in the imported file before the import process starts. So, you have a great chance to correct any mistakes that may occur by using the report generated by the extension. This module is also available for Magento 1. Magento orders export is an acute problem for many e-stores. Common approaches work well when entrepreneurs need to export all the order data from the platform. But exporting selected order fields and entities is a thorny issue for many Magento sites. It often involves extra efforts. Time is priceless, so it’s better to leverage a ready-made extension like the one we described above to do all the required work for you, while you focus on what really matters.